There are so many things going on in the Dayton area art world that it is hard to keep up. The Middletown Show and the Western Ohio Watercolor Society Show in Troy are getting ready to open. The Ohio Watercolor Society Show in Pepper Pike and the Piqua Art Show are ready to view. FAA has artists involved in all of these wonderful shows, as well as in festivals throughout the area. October is one of the most beautiful months to find inspiration, so get outside and take photos, or paint, or just breathe in the crisp autumn air. We look forward to viewing your beautiful work. We have a workshop by nationally known instructor and artist Nita Leland the first week in October that has space available. Flyers are available on our website, fairbornart.org or in the Gallery. See you at our meeting on October 2 at 7 pm. The Board will meet at 6 pm. Nita is our resident expert on color. She will be conducting her Color Clinic Workshop October 2 through 4 in our Gallery and will be the speaker at our meeting on October 2. Nita is skilled at getting beginners started, de-mystifying color theory and inspiring creativity and self-confidence in her students at all skill levels. The Nita Leland workshop is quickly approaching and we still have room for 4-5 more students. Everyone I know who has taken her class says this is a “must” for all artists. You learn so much about color, mixing color, using different colors together and much more. Final payment of the $200 for members or $235 for non-members is due no later than September 29. Nita Leland will present “Color Clinic” at the Fairborn Art Association Gallery on October 2, 3, and 4, 2018, from 9:30 am to 4:00 pm. 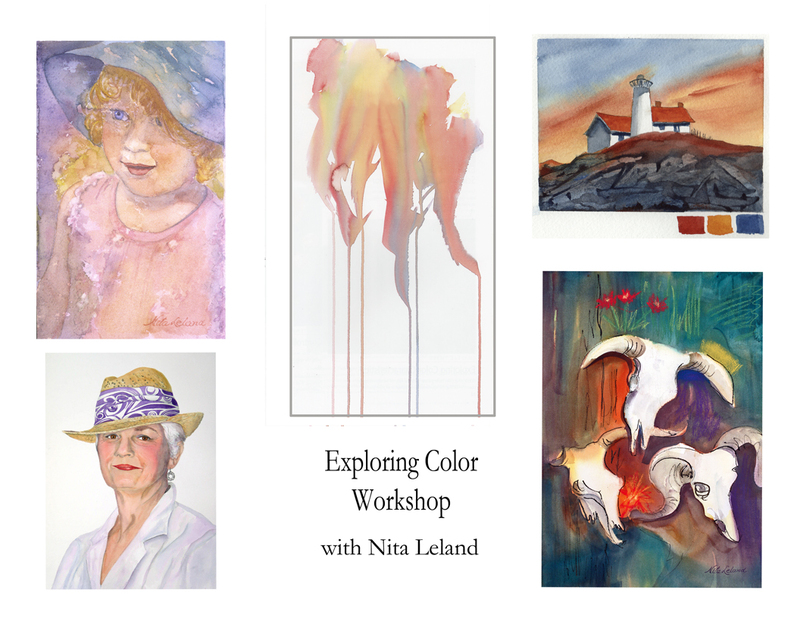 Nita helps watercolor artists understand all about paint and how colors work in mixtures, how to create vibrant color expression using triads to enhance your artwork, and how to use the seven contrasts of color to improve your artwork. You will learn about paint characteristics, organizing your palette and more. There will be mini-demos and class critiques throughout the day with lots of painting and individual attention. Finished artwork will also be critiqued in class upon request. Nita began her art career in watercolor and has been teaching classes and workshops in color, collage, and creativity throughout the U.S. and Canada for more than 40 years. She currently teaches at the Enrichment Center in Dayton, Ohio. Visit Nita’s website at www.nitaleland.com and blog at nitaleland.blogspot.com. To register, please send a non-refundable deposit of $40 along with your registration form to Pat Dunker, 30 Innisbrook Close, Xenia, OH 45385. Make checks payable to the Fairborn Art Association. Final payment must be made by September 29, 2018. A flyer and registration form will be available in the Gallery and are attached. For questions, call Pat Dunker at 937-562-3014 or cell 937-271-4798, or email pwdunk@gmail.com. Below is some additional info that Nita recently sent to me. A Chairperson is needed for the 2018 Holiday Show and Sale in December. This has been a fun show and sales have gone well in the past, but we can’t have it if no one will Chair it. Barb Olekas has volunteered to assist but cannot chair it due to prior commitments in December. Anyone? Call Billie Dickson at 937-902-6410 please. Sending out a BOLO (Be On the Look Out) for artists who have left artwork in the Gallery: Kara McWest – 3 pieces from the Landscape Show; Barbara Arnold – 1 piece from the Landscape Show; Erin Smith-Glenn – 1 piece from the May Member Show; and Carylon Seger – 1 piece from a previous Member Show. Please come pick up your artwork. The meeting on October 1 is the best time, or call Gallery Coordinator Lori Luckner at 937-235-2513 for other dates that may be available for pick up. Or, if you know one of these people, perhaps you could pick up the work and take it to them. Also looking for people who are missing clothing – we have quite a collection that has been hanging in the hallway for a long time. Thank you. Sympathy cards were sent to two of our members, Barb Arnold and Sue Brezine, who both lost their husbands recently. We are sorry to note that our member Marilyn Hart recently passed away. A card from the organization will be sent to her family. Calling all creatives and makers! The Logan County Art League is offering a weekend retreat at Kirkmont Center near Zanesfield, Ohio, the weekend of October 12, 13, and 14. No matter what your creative passion is (writing, painting, quilting, photography, etc.) this weekend is an opportunity to get away in a beautiful scenic area, with great accommodations and food, and work and enjoy the comradery of other like-minded individuals. Enjoy a weekend of relaxation with time to concentrate on your special area of creativity. Explore the 270 acres of woodlands, grasslands, wetlands and ponds. Hike, meditate and gain inspiration for the artist within. Curl up in a chair and read undisturbed. WiFi is available… or unplug for a weekend. Take a break from the rat race. Breathe! Laugh! Create! Accommodations are dormitory style at the Croft House on the upper level, which also includes a large living room and dining area. A kitchenette is available. A loft area is also available as a getaway. There is a large deck area. The lower level is one large space that is used as a workspace for the artists. Meals are served at the Lodge, except for breakfast that is catered. There are several payment levels for those who want accommodations for the entire weekend, those who can only stay one night, or those who want to commute back and forth each day. Meals are included in some of the plans. For details, costs and a registration form, go to the LCAL’s website at www.logancountyartleague.org or the LCAL Facebook page. Any questions can be asked at amidonclayton@gmail.com . For further information contact: Forrest Amidon, Chairperson, (937) 844-3102. If you have access to the internet, please go to our website at www.fairbornart.org for additional articles throughout the month. We also post photographs of meetings and other events that we are unable to publish in the printed version of this newsletter. The following people signed up to bring refreshments to our next meeting: Carol Edsel, Samara Blankenship, Bonnie Kuntz, Jada Keplinger, Linda Perry, Evvie Moore, Cheryl Miracle, and Maggie Vance. We may need more volunteers for this popular meeting since it is the first day of the workshop. We usually have 50-60 members in attendance, so please plan accordingly. We also need a volunteer to help in the kitchen before the meeting to prepare food for serving. Thank you for volunteering. Our next meeting will be Tuesday, November 6, 2018, at 7:00 pm. The deadline for submitting articles to be included in the November Newsletter is Monday, October 22, 2018. Please email your articles to Albright10@msn.com or call Jackie Albright at 937-233-7532.